Dreaming Of A New Patio? There’s nothing to put the finishing touch on your property like a custom-designed paved patio. Choose the combination of styles and colors that perfectly match the rest of your home, and benefit from the long-lasting quality of the pavers our company provides. Whether you choose rustic Mediterranean-style cobbles or sleek slate tiling, we can guarantee you’ll be amazed at the result. 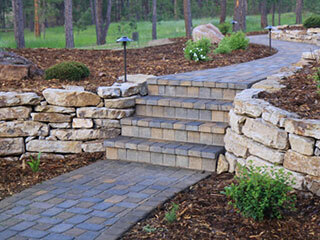 We provide backyard patio pavers in a wide range of different designs to compliment the look of every property. Our team is always happy to help a customer pick out the perfect match. Every time you use your patio, whether it’s sitting in the morning sun with a cup of coffee or in the evening with some close friends, we want you to feel proud of how your home looks. Pavers drain water away much faster than the alternatives, such as concrete. Less water means less chance that people will slip and injure themselves. In addition to this, these units can have a textured surface that will help you keep you footing and provide excellent grip for your shoes, boots or bare feet. Patio pavers retain their color for a long time, especially when regularly treated with brick sealer. This helps protect them against stains and also reduces the effect of the sun’s UV rays, which can bleach out their color. All our tiles are treated to withstand heavy use, and you can rely on them to last a long time. Unlike decking and concrete, pavers can be quickly and easily removed if they become damaged. Because they are made to uniform shapes, our company can provide replacements which will easily match the rest of the layout. That means you'll be able to keep your patio looking at its best for generations, which is why using these tiles typically adds a significant amount of value to your home. Be it for your backyard or front patio, our team at S&P Hardscape Remodeling Los Angeles is always ready to help. If you’d like to know more about the patio paving services we provide, or you’d like to consult with our experts, simply give us a call today. What are the benefits of using concrete pavers for a patio? Concrete pavers are highly versatile and an experienced professional can help you design a unique and personalized patio using them. They come in a range of colors and shapes and can be cut to match the specific size and design of your property. They are cheaper than poured concrete, asphalt, and granite, with a life expectancy of over 30 years. Concrete pavers are prepared in molds out of an aggregate of cement and sand, making them tough and durable. They expand slightly in the summer and compact in the winter, but the spaces between them allow for the size changes without any damages. They can be naturally slip resistant and require very low maintenance except for cleaning and the occasional weeding. What type of pavers are best for my patio? There are many options available: concrete pavers, brick pavers, and natural stones such as flagstones are the most popular options. Pea gravel, slates, decomposed granite, and other types of recycled material are also used quite frequently. Your decision should be based on the surrounding environment, your budget and the look you are trying to achieve. Concrete pavers are the most popular choice because they are available in a wide range of colors, sizes, textures, and finishes. Bricks, on the other hand, are cheaper but come in limited size options and need ongoing maintenance. Natural stone like sandstone, limestone, and granite can create an earthy quality but are a more expansive option. Porcelain pavers are also becoming very popular as of late. They offer similar advantages as concrete units but with the additional option of a dry installation directly onto the grass, gravel, dirt and/or sand without the need for grout and adhesives.